Eastern sophomore Matthew Blanchard (2) delivers a pitch during the sixth inning of Tuesday night’s TVC Hocking baseball game against Wahama in Tuppers Plains, Ohio. Wahama junior Trevor Hunt rounds third and heads home for a score during the sixth inning of Tuesday night’s TVC Hocking baseball game against Eastern in Tuppers Plains, Ohio. TUPPERS PLAINS, Ohio — An impressive statement. 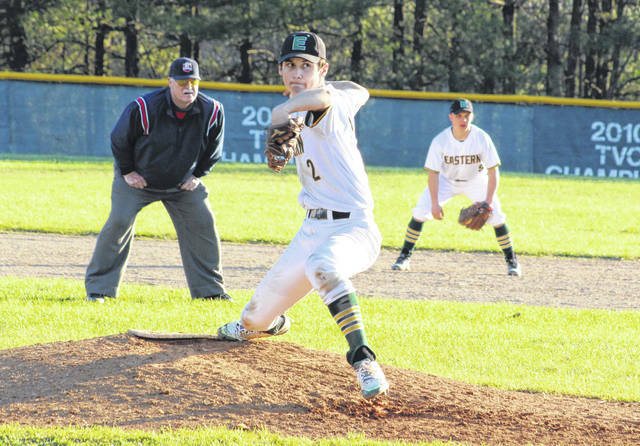 The Eastern baseball team never trailed and secured sole possession of the early league lead on Tuesday night with an 8-5 victory over visiting Wahama in a Tri-Valley Conference Hocking Division matchup in Meigs County. The host Eagles (5-0, 3-0 TVC Hocking) led 2-0 after an inning and were ahead 4-1 through three complete, but the White Falcons (6-2, 4-1) rallied with a pair of two-run frames to knot things up at five midway through the sixth. The Green and White, however, used three singles and an error to push home three scores in the home half of the sixth for an 8-5 edge, then faced four batters in the seventh to wrap up the three-run triumph. Eastern outhit the Red and White by a slim 10-9 overall margin and also committed three of the seven errors in the contest. The hosts left only five runners on base, while the White Falcons stranded eight on the bags. The Eagles also received a solid performance from winning starter Matthew Blanchard, who allowed three earned runs, nine hits and three walks over seven innings while striking out 10. Blanchard struck out the side in the second and also fanned at least one batter in every inning except the sixth. For a program that graduated 11 players from a Division IV regional finalist, EHS skipper Brian Bowen noted that this outcome was a real sign of growth from his young troops … particularly against the likes of the White Falcons. WHS coach Billy Zuspan was equally impressed with his counterparts, particularly in some of the smaller details that later defined this outcome. Zuspan also noted that there is still a lot of baseball left to be played. The Eagles got back-to-back singles from Blake Newland and Nate Durst to put runners on the corners in the first, then Blanchard singled in Newland for a quick 1-0 edge. Durst later stole home and gave the hosts a 2-0 advantage through an inning of play. 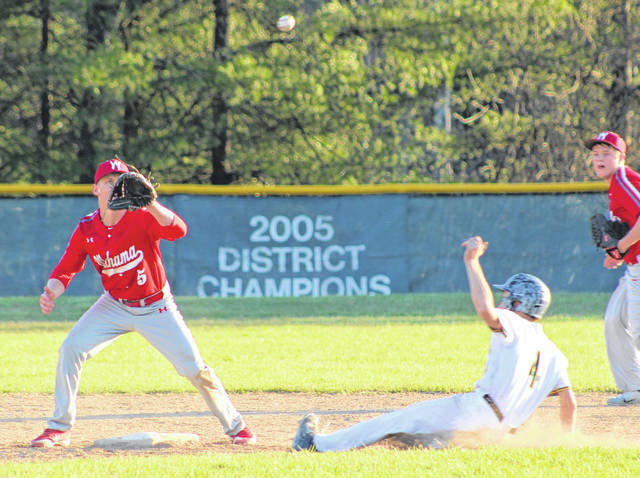 Wahama’s first score came in the top of the third as Tyler Bumgarner doubled home David Hendrick for a 2-1 contest. Eastern used a pair of errors to get Newland home for a score and Blanchard on second, then Blanchard came around on a single by Conner Ridenour a 4-1 contest. The guests closed back to within a run in the fifth as Hendrick scored on an Antonio Serevicz double, then Tanner Smith singled home Jonathan Frye for a 4-3 contest. The Eagles answered with a run in their half of the fifth as Durst came homeward on an in-play error that followed a single by Isaiah Fish — pushing the lead out to 5-3 through five full frames. Hendrick tripled in Trevor Hunt with one away in the sixth, then Hendrick scored on an error that ultimately tied the contest at five. Eastern, however, got a single from Bruce Hawley, who then stole second and later scored on a one-out single by Colton Reynolds. Reynolds then stole second and came around on an error for a 7-5 lead. Durst — who advanced all the way to third on that costly error — also crossed home plate following a single by Blanchard. Frye ended up taking the loss after surrendering four runs (one earned) and six hits over 3.1 innings of relief while fanning two. Durst and Blanchard paced EHS with two hits apiece, followed by Newland, Fish, Ridenour, Hawley, Reynolds and Brayden Smith with a safety each. Blanchard and Ridenour each drove in two RBIs, with Durst and Newland leading the way with three and two runs scored respectively. Hendrick led Wahama with three hits, followed by Bumgarner, Serevicz, Smith, Hunt, Jacob Fisher and Zachary Fields with a safety each. Hendrick also scored three runs in the setback. 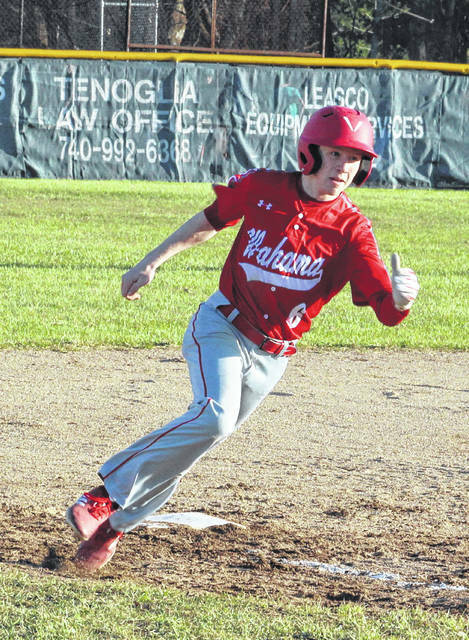 Wahama — which had a three-game winning streak snapped — hosted Wirt County on Wednesday and returns to action Thursday when it welcomes Belpre for a TVC Hocking contest at 5 p.m.